Myanmar saw two defining moments over the past two weeks. The most important one was release of Daw Aung Suu Kyi, Nobel laureate and one of the most respected political leaders in the World, having completed her term of detention on 13 November. What has perhaps shocked the military junta is euphoric response of the people of the country to Aung Suu Kyi and her halo which has mesmerized television screens across the globe. Indeed it is freedom of the spirit which could not be imprisoned over the past two decades. The spirit of great leaders as they say always remains free. Some however fear that Suu Kyi’s free spirit may prove to be her undoing. Many are still skeptical if the release is likely to be a permanent or a temporary one. Twice in the past she was released only to be back under detention. 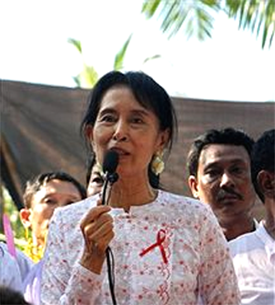 The cheer that she has attracted from the public should also be a stern warning to the junta that people are solidly behind Aung Suu Kyi. This may be another sign of danger for the freed leader; for the government does not seem to be either used to or welcomes the euphoria over her release. The second event of course is the general elections, ironically held a week before Suu Kyi’s release on 7 November, after almost two decades. These as expected were won by the official political formulation led by a former general and the current as well as possibly the next Prime Minister, Mr Thein Sein. The pro-junta Union Solidarity and Development Party (USDP) has won the elections gaining 76.5 percent of seats, while some ethnic parties as the Shan Nationalities Democratic Party (SNDP) won 57 seats; the Rakhine Nationalities Development Party (RNDP) 35, and the National Democratic Force (NDF) an alternate to the National Liberation for Democracy and All Mon Region Democracy Party (AMRDP), each have one 16 seats. On the other hand the two events may also be an opportunity for the Myanmar government to shift towards greater openness and transparency in the wake of the double whammy of release of the long time political detainee, Aung Suu Kyi and the elections. The junta should attempt to explore possibilities of opening up to the World as it has not isolated itself as much as other regimes as North Korea which had been interacting only with selected states as China or Iran. Myanmar on the other hand has been engaging countries including India and the ASEAN and therefore has been more amenable to influence. The shift from isolation to an attempt to integration is a move in the right direction in the country and hopefully comes through. One indication was seen when Myanmar Prime Minister Thein Sein gave a speech in Phnom Penh attempting to attract business to the country claiming that it was amenable to opening up for investment. So far Myanmar has been open to only the favoured companies of the junta including some of the European ones as Total. Now if the government is serious this may be a shift in the right direction for the country’s rich natural resources will be put to fruitful global use earning much dividend for the people as well. There is a possibility of this happening. Myanmar’s military junta is more used to going step by step. It has already taken two giant steps, elections and the release of Suu Kyi. Things may not move as fast as the freed leader has indicated and it is apparent that she too recognizes the reality and has not chosen to target the military and is likely to adopt a wait and watch policy and allow the things to develop. What is a good sign is that she is not likely to take a path of agitation and hopes for reconciliation. Whether the junta is willing to accept a compromise at this stage remains to be seen for that would need a major shift and surrender of power which may not happen. But now there is an additional structure for negotiations that is the “elected,” government. This will ensure that some semblance of talks for greater freedom emerges. How some of the other protagonists the ethnic groups view the release of Suu Kyi will also be an important marker in the days ahead. India could prove to be a game changer as the country has had influence over the military leadership in Myanmar, despite the verbal lashing that the US President Barack Obama gave during his speech in the Indian Parliament; India’s first reaction to Suu Kyi’s release was reconciliation. Aung Suu Kyi’s own response was that she was willing to engage the military government. Thus the Indian response appears to be a pragmatic one. How this can be converted into practicality which will see the people of Myanmar gain freedom not just of the spirit but also of body remains to be seen? Hopefully this time around Suu Kyi’s liberty brings about change in Myanmar nee Burma as she calls her country by its original name.